Red Sea: Exodus 14:5-8, 13-18, 21-31. Traditional Sunday School curriculum would break these into a series of single lessons, ensuring that in most churches, most of your children wouldn't hear them all (becaue most children wouldn't be there every week), or remember them (repetition is the cornerstone of remembering). In this set, and in the Rotation Model, we teach these four stories as "four episodes" or scenes of the same story: God rescues and provides. To include the four scenes in one lesson, we thus have to excerpt, and fortunately, these short passages easily lend themselves to this approach! Each workshop lesson in this set approaches the "reading" of these four scenes in different ways. For example, in the Video Workshop the scriptures of Sea/Marah/Manna/Rock will be seen and heard in the video, and then focus in on one passage. Another lesson in this set uses a condensed reading. Another incorporates excerpts in the activity. Or the "Eagle" image in Deuteronomy 37: 9-11 quoted fully above. "...he spread his wings to take them up and carried them safely on his pinions." Exodus 15:2, 3 The Lord is my strength and my song; he has become my salvation. He is my God, and I will praise him, my father’s God, and I will exalt him. The Lord is a warrior; the Lord is his name. Exodus 15:11 Who among the gods is like you, O Lord? Who is like you –majestic in holiness, awesome in glory, working wonders? Exodus 14:13a But Moses said to the people, ‘Do not be afraid, stand firm, and see the deliverance that the Lord will accomplish for you today’. Locate the story in the Bible. Have a working knowledge of the four scenes: Red Sea, Marah, Manna/Quail, Water from Rock. Understand that the stories tell us that God provided for the needs of the Israelites and that God provides for our needs as well, even when we complain, are afraid or doubt. Understand that the Exodus story is a story of Redemption (Salvation), and that the stories use many synonyms for this concept: "rescue," "help," "guiding," "providing." Understand that each of us travels through personal wildernesses on our journey through life, and can trust God to forgive our doubts and fears, to save, guide and provide. Note: Some of the lessons in this set have additional background and teaching points. The story of the Exodus is a huge story, and one that's hugely important to teach children because it begins the great story, that of the redemption of humanity. The "paradise lost" of Genesis will turn into the hope for a Promised Land in Exodus, and the Kingdom of God in the Gospels. 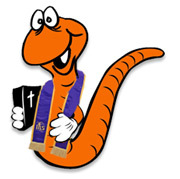 The God who created and wrestled, will now take the lead in the desert, and then walk out of the desert, saying, "Come Follow Me." It is a story which lays the groundwork for the rest of the Old and New Testament, of God's call to follow, the people's failure to do so, and God's frustrated, yet gracious response. God's rescue and providence in these episodes begins the "drumbeat" heard throughout scripture which culminates in the angel's announcement to Mary: "Be not afraid, the Lord is with you." For the next three millennia, the images and language of Exodus will permeate cultures, inspiring captives towards freedom, and strength to those in the desert. Jesus himself will journey into the desert and emerge 40 days later --clarified and prepared for the work ahead. The main parts of the Exodus story, ...Burning Bush, ...Moses' Confrontation with Pharaoh, ...and the splitting of the Red Sea, are some of the most well-known stories in the world. And indeed, that's where many popular versions of the Exodus leave off: halfway through, and thus, only halfway through its full meaning. This lesson set focuses on the lesser-taught but vitally important "rest of the story" that takes place BETWEEN Egypt and the giving of the Ten Commandments: Sea, Marah, Manna, Rock. Properly speaking, these four are not the "wandering in the wilderness" stories. Those come AFTER the giving of the Ten Commandments and are described in the Book of Numbers. Rather, these four stories are continuations of the Exodus rescue from Egypt begun at the Red Sea. These are the "get away" stories, so to speak, and what we immediately learn is that God is leading, not Moses. In many ways, these four stories are four scenes in a single play and message: The people follow in doubt and fear, and God continues to care for them in spite of their lack of faith. The people's attitude is predictable —it's what these four stories tell us about GOD that's refreshing and reassuring: God saves and God responds to their needs, not once, but several times in a row, ...in spite of their complaining. That's the gospel in the story we want to share with our kids. God will respond to YOUR complaints, fears and doubts. God keeps on saving. The journey (of life, of faith) is, in fact, sometimes hard and scary. We do have doubts and fears. And God hears and responds. God cares, gives, and comforts. God saves because of who God is, and not because we are great followers. Do not afraid. Do not doubt. Do not fear. See how the Lord is with you. A lesser god and less compassionate leader would have punished the children of Israel for their complaining, and indeed, there is that strain of thought that lingers in some scriptures. But the overwhelming sentiment of scripture and these stories, is one of grace. The God of Moses RAINS manna from heaven and makes water GUSH from the rock. It's common to focus on Moses as a great hero, but Moses himself makes these stories about God. When confronted by the people, Moses goes to God. And when God responds, Moses gives the credit to God. These stories tell us what we can expect from our God, his character, faithfulness, and care. And they reveal an unflattering truth about each of us: we need saved, we need fed, and we need led —constantly. This is the message of Jesus Christ as well. Be not afraid, the Lord is with you. One of the great challenges of teaching the Exodus is deciding which Bible verses to read. There is a practical limit of how much you can read in one lesson, and these stories span several chapters. (We often encounter this issue when teaching big stories, ...Esther comes to mind.) This lesson set steps up to that challenge by not limiting our understanding of "scripture" in the lesson to "what can be read on a page." The video workshop is a good example of this understanding. The video depicts and speaks scripture, and the follow-up activity looks at a specific passage that digs into meaning. Over the course of the four or five week rotation, your students will see, hear, play, and read the story, with the result being that the scripture is impressed on their memory and written on their hearts. The Exodus being a major story, our students will encounter its scriptures many more times in the Church. One of the virtues of the Rotation Model is that we take our time to teach important stories. This allows us to dive deeply into parts of the Exodus story which traditional curriculum can only gloss over in its drive to teach 52 stories a year. If you are teaching in a traditional program and reading this background, resist the temptation to squeeze these "Water and Wilderness" stories into one lesson. "One and done" simply can't do justice to these stories, and it is unlikely that your students will remember what you taught. Was there really "an" Exodus? Modern scholars and archaeologists debate the question of the Exodus story's "historicity," as if the truth of the Exodus story is somehow dependent on factual evidence that can be dug up in the sand. Yes, the Exodus was likely a much smaller historical event than the story describes. Maybe even more of a migration than fast exit. And yes, as one of the lessons points out, the "crossing" likely took place at the Sea of Reeds rather than the Red Sea ("Red" and "Reeds" are the same word in Hebrew.) ...But those are mostly "big kid" discussions. And the truth of the story -its description of the human condition and God's response is independent of geography. What we're teaching is the truth these stories reveal about God and about us. The Exodus story isn't just something that happened in the past. It is a journey that has been repeated by countless millions who have immigrated from a dark past to a promising future. ...By those who have been afraid and kept moving forward. By those who have suffered, only to find strength and the presence of God in their desert. It is THE cautionary and inspiring tale of those looking for a better life beyond the captivity of their past, and wondering if God is with them at the edge of the foaming sea and in the heat of the desert. Did it really happen? Yes, it DOES, and did. You and I have been there and through it, and our students will go there too. "Save Us Now!" the crowds yelled to Moses, and then to Jesus. ...even when we try to kill him on a cross. You hear a lot these days about "explanations" for how the water could have piled up in the Red Sea. Such inquiries forget that miracles by definition have no explanation other than God is God. Traditionally, most scholars place the crossing at the "Sea of Reeds" just east of Succoth, and not across the southern "Red Sea." "Red" and "Reeds" are the same in Hebrew. What's important is not the location, but the problem and God's dependable response. Bitter waters made sweet. Water in the desert is obviously an important find, and bitter water is not uncommon. "Bitter" here also has an obvious double meaning: the people were bitter. A lot has been written about "what the manna might have been," but there is no satisfying or consensus answer. Again, it was a miracle, which by definition is meant to defy reason, and simply be a example of God's power over even Creation. Of greater interest in this story is Moses' command to keep some of it in an "Omer" (a jar that holds about 9 cups) as a sign of how God has blessed. In later Jewish tradition, "counting your Omer" or "counting your blessings," was a practice during the Passover season. The word "Manna" has several possible meanings, including a Hebrew play on the phrase "man hu?" which means, "what is it?" (This is what the people in the story said when they saw it.) Manna is very likely the Hebrew version of "mennu" –the Egyptian word for food. This is where the word "menu" comes from. "Manja," the hip word for food is actually a very ancient term. "Manja" or "man" in the word "manna" is the same root word used for "manger" –the food trough Jesus was laid in at his birth. Traditionally known as the "Rock of Horeb," ...Horeb being the ancient name for Mt. Sinai, the rock is thought to have been located near the base of Mt. Sinai. Interestingly, the rock story in Exodus 17 is retold in a different way in Numbers 20. In that version, God tells Moses to speak to the rock, but Moses strikes it instead. Numbers says that is the reason why Moses was not allowed to enter the Promised Land. The Israelites didn't actually "wander" for 40 years, though that is the Sunday School version of it. According to scriptures, they settled in the Kadesh-Barnea region south of the Promised Land and lived there for a generation. 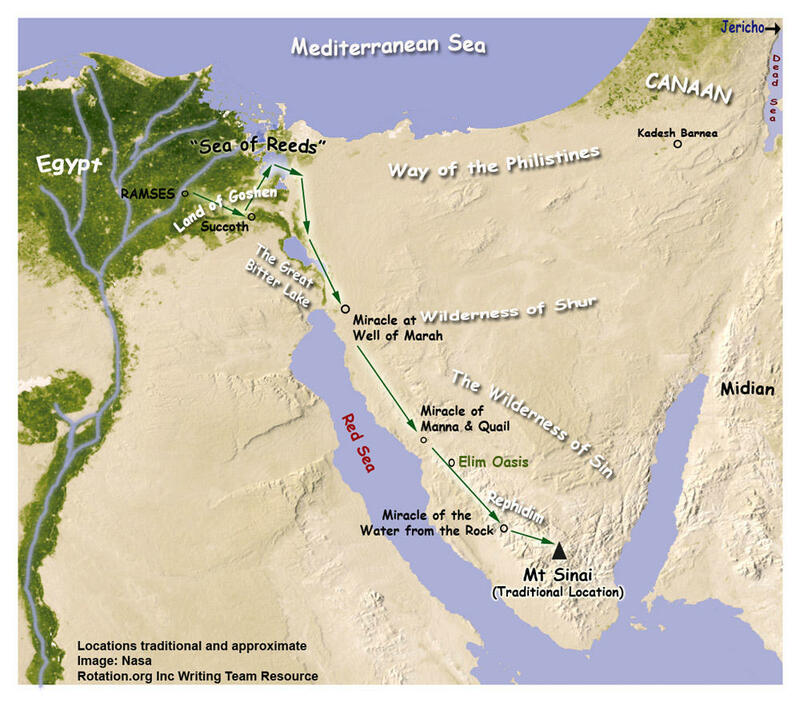 The attached map of the Exodus Rescue Route is based on traditional scholarship. The map is referenced in a number of lessons in this set. With contributions from Team volunteer, Lorna Loeffler.